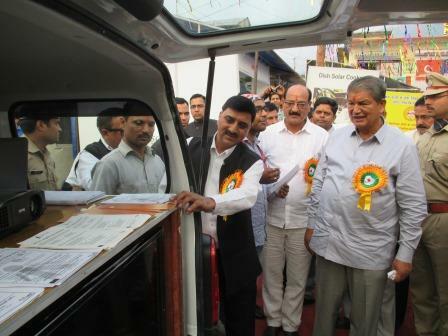 On 40th year of celebrations of Maa Kunjapuri Mela in Narendra Nagar, Chief Minister of Uttrakhand, Mr. Harish Rawat, was invited as Chief Guest in the ceremony. He inaugurated the event and after a speech about development and progress within the area, he inspected the stalls that were set up in the fair. During his stroll across the stalls, he saw Soochna Seva Vahan and after learning about the services provided by Soochna Seva, he praised the team for the work and encouraged to continue the same for the future and help people.